Sam, Clint and the rest of the Mid-Surrey team did a truly fantastic job. From the start – digging out a mountain of soggy clay and old slabs – to the finish – using state of the art grouting, they took the greatest care over the detail of design and finish. They never failed to clean up before going home every day, which made it much better for us, and for them the next morning too, of course, and were unfailingly cheerful and polite even in the worst weather. Not cheap, but you get what you pay for – a first class result which we love, better even that we had hoped for at the start. Removal of old patio and replacement with a substantially bigger and more complicated two-level terrace. Sam and the guys did a great job. Sam always provides excellent communication so there’s absolute clarity on both sides. He works in partnership with you to achieve the best solution for the budget keeping you informed at all times. This was the final phase of a complete renovation of our property and Mid Surrey have performed brilliantly. Complete driveway and entrance with double hardwood gates. Mid Surrey Renovators completed renovated our home including building a two storey extension. This included, moving the front door, new windows, moving the stairs, rewiring and re plumbing. The works took 11 months to complete and came in on schedule. Sam Cullingham (the owner of Mid Surrey Renovators) is an honest builder and very transparent with the budget/costs. He worked well with our architect and kept us (the client) informed every step along the way. 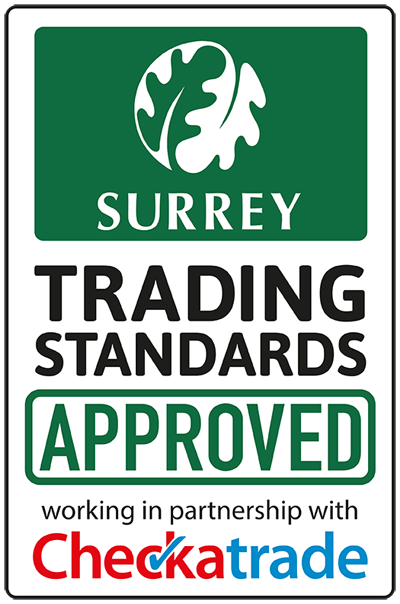 I have already recommended Mid Surrey Renovators to several of my friends and would recommend them to all using Checkatrade. Sam and the team completed a major refurb of my kitchen, including removing an existing chimney breast, installing French windows and completely rearranging the kitchen layout. Although the job took slightly longer than expected, Sam kept me informed throughout, and the standard of workmanship in the finished kitchen is excellent. I would recommend Mid Surrey’s services. Very clean work completed by skilled tradesmen. Kept in the picture at all times. Not the cheapest quote but more than satisfied with the result. Would endorse this company without hesitation. Re pointing mortar and replacing damaged brickwork.